Here's the second mini-set I'm posting as an ode to 1988, my favorite year in the '80s. 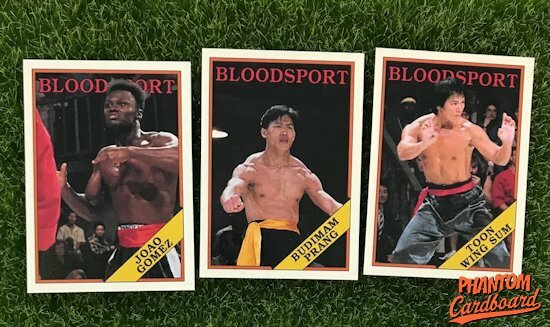 The first was Beetlejuice, and now here's Bloodsport re-imagined as a vintage inspired trading card set. 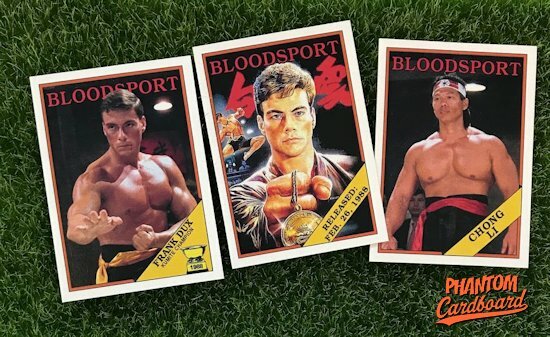 Happy 3-0, Bloodsport! A couple weeks ago I had this as a four card mini-set that was inspired by the 1988 Topps baseball set. There was "Frank Dux", "Chong Li", "Ray Jackson" and "Janice Kent". I was ready to drop that grouping in the PCb card shop and then it happened... I decided to go and rewatch Bloodsport. I had not seen this movie in a few years and forgot just how much I marked out for it. In watching the movie and thinking about the 1988 Topps set I quickly realized I was not going to be satisfied with just a four card representation for such an epic and card-worthy movie. The first step was to jump the ol' Google machine and start collecting images. I was able to find almost everyone I needed with the exception of maybe "Inspector Chen" and "Ricardo Morra". Notwithstanding those two this is my largest mini-set to date with a 19 20 card checklist. 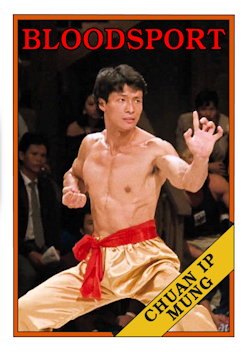 This first card made for this set was JCVD as "Fank Dux", and that was quite awhile back. I made this one because you'll occasionally see collectors have through-the-mail successes from Jean-Claude. As it turns out I was one of the lucky ones and got my original "Frank Dux" card signed. When adding onto the set I found a different image that I wanted to use for the "Dux" card so that one actually changed. 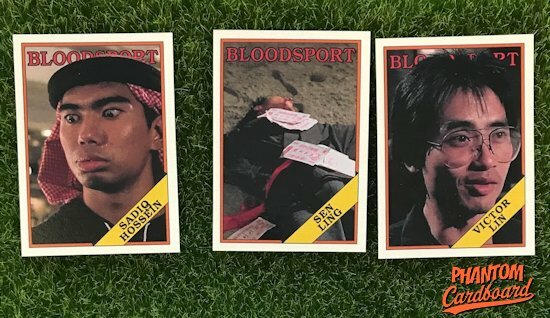 The others remained the same with the exception of of making the Bloodsport title a brighter red to show up against the dark background that a lot of the images had. You'll see I used the Topps All-Star Rookie trophy on this card to represent "Dux's" 1988 Kumite title. I know I've mentioned it before, but when I was a kid I really thought that little trophy made the card it was on 100x cooler. I really liked Jean-Claude when he burst onto the action scene in the late '80s. I look at him as a hybrid '80s action hero. He's got the foreign mystique of Arnold, the lean build of Sly, and the martial arts credibility of Chuck Norris. 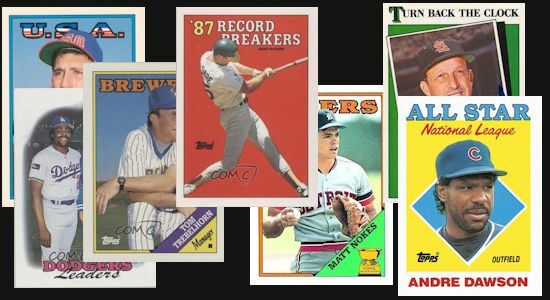 I really loved the look of the subsets in the 1988 Topps and wanted to incorporate them into my set while also having them make sense to a certain extent instead of just randomly adding an image to the template, so a decent amount of thought went into each. I definitely wanted to have a card for the "Ok, USA" guy who has grown imto an internet legend over the years due to (I presume) his soulful exuberance for America? Originally I was going to use the Team USA cards as an inspiration for his card. I also really wanted a card inspired by the All-Star subset. I couldn't decide who to give the all-star nod to so instead I combined the two ideas for the "Ok, USA Guy's" card. I had to change the all-star card's diamond design to a rectangle to fit the image of "Ok, USA Guy". In the movie "Frank Dux" breaks the Kumite world record for quickest victory when he dispatched the all bark, no bite "Sadiq Hossein" in mere seconds. So naturally this was perfect for the "Record Breakers" subset. 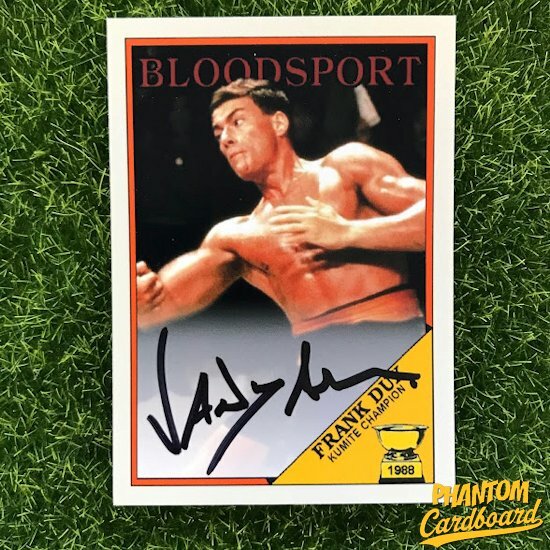 Frank Dux is a real guy and Bloodsport is mostly (maybe loosely) based on a true story and as legend has it Frank broke the record for fastest Kumite victory in 1975. I think I remember liking the "Team Leaders" subset as a kid. Each team had a "Team Leaders" card, usually picturing two top stars. Looking at them now, from a design standpoint they're kind of, eh, lazy? 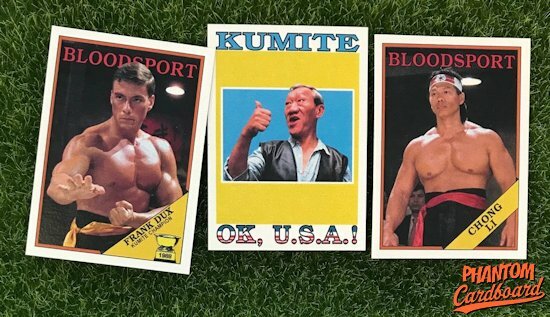 But, they do have a certain charm and also a great way to make one card of "Helmer and Rawlins" -- the two Army CID officers sent to Hong Kong to stop "Frank Dux" from competing in the Kumite. It was a two-for-one special. 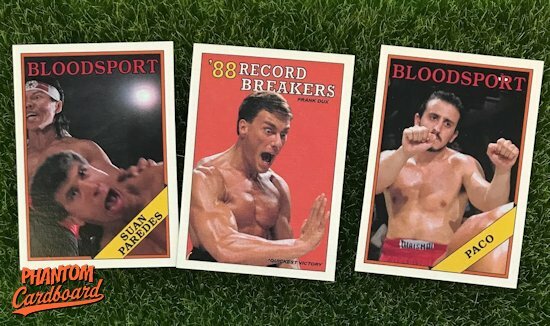 "Frank Dux" has that flashback that gives his origin story telling how he came to study ninjutsu under "Senzo Tanaka" which gave the perfect opportunity to make a "Turn Back The Clock" card. The scene itself is a bit unsettling with its dubbed over and slightly sexualized dialog, but none-the-less I like the card. The Kumite that the movie is supposed to be based on was in 1975 but different things in the movie definitely give the impression that it's taking place in the late '80s even if I didn't catch any mentions of specific years. Since there wasn't that specific year mention I chose a 1983 Topps baseball inspired design for the throwback card. If you estimate "Frank Dux" to be in his early 20's that year can make sense. Since young "Frank" was wearing a San Francisco Giants baseball hat I used their team colors from the 1983 set for the Turn Back card. Plus, I just really like the '83s. To not be too serious some of the Kumite competitors like "Pumola", "Suan Paredes" and "Sen Ling" are featured in the thralls of defeat on their respective cards. Update: last minute addition, and this mini-set is now available in the PCb card shop.